For his bug hunting outfit, Taylor opted for the shirtless look. It was a warm day, and while I don’t want to encourage frequent shirtlessness, I did find it pretty amusing so I let him be. 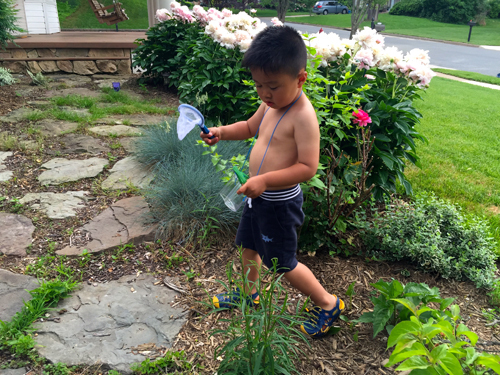 We started out looking for insects in the front yard — and it was fun to pretend that it’s a jungle out there! Taylor took his role very seriously as a bug hunter; here you can see him in the midst of our peony and rose bushes searching for bugs. Taylor had spotted a few spiders, but each time we (OK, not so much we, more I) failed to catch them. Those spiders are fast! By the time I missed spider number three, Taylor was starting to get discouraged. With the sun beating down on us, Taylor decided to take a break. It was then that I spotted one of those giant mosquito-like bugs fluttering around against our garage. 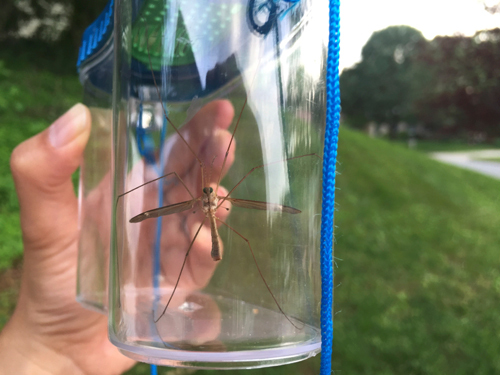 It turns out those bugs are called crane flies (well, I believe it’s a crane fly based on my image matching skills courtesy of Google Images). This time, with the use of the net, I was successful in catching it. Seeing an insect up close in a bug catcher is a very neat experience. I stared at the crane fly’s long spindly legs and and dragonfly-esque body for quite some time. Taylor loved the experience too. 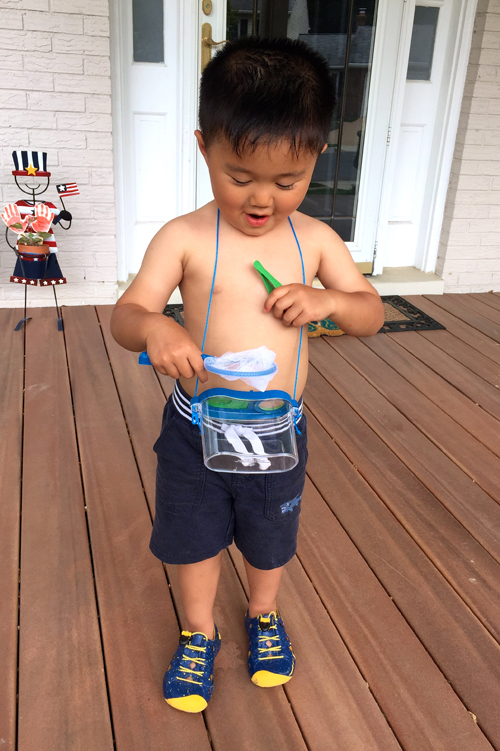 He enjoyed looking at the “giant bug” through the magnifying glass. 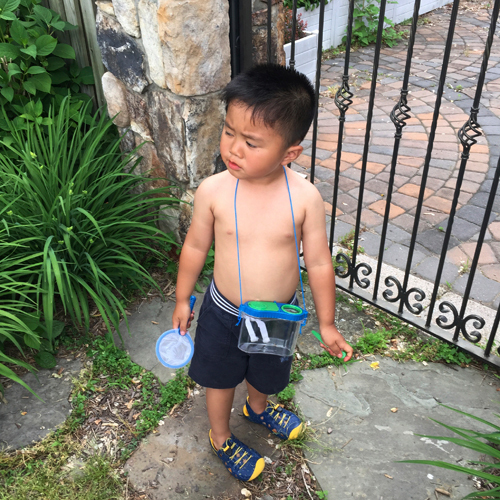 However, with the attention span of a three year old, he oohed and aahed for thirty seconds, and then moved on to play with bubbles in our driveway. Taylor just turned three, so he didn’t come to me and say, “Mommy, I’d like to learn more about bugs please.” But I thought the bug exploration would be a fun one for us to continue, so I went to the Start with a Book site to see what they had on insects, and found the Bugs, Birds and Animals topic. I looked through the list of recommended books, and picked a few that seemed well suited for Taylor’s age. As I was selecting them, I found myself wondering when I’d have time to go to the library and search for these books. That’s when I remembered that Fairfax County libraries offer the service of locating and holding books for you. I’d never used that service before, and this was the perfect opportunity for me to test it out. 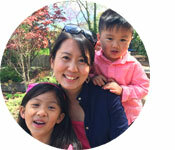 I logged into the Fairfax County library site, found the books, and then clicked “hold” — it was that simple. The next day, I saw in my e-mail that The Icky Bug Alphabet Book was on hold for me and ready for pick up. So I swung by the library, went to the hold section, found the book under my name, and was in and out in less than 5 minutes. 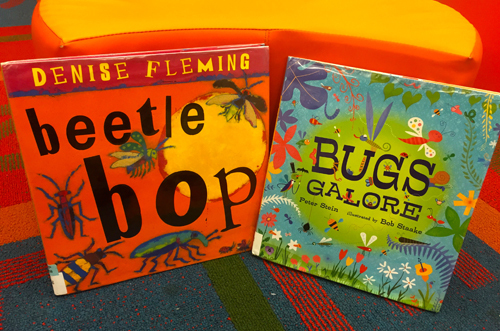 A couple of days later the other books I put on hold, Beetle Bop and Bugs Galore, were ready for me to pick-up (these books were at other Fairfax County libraries so it took a couple of days for them to arrive at the library I go to). Taylor liked repeating the title Beetle Bop; he thought it sounded funny. 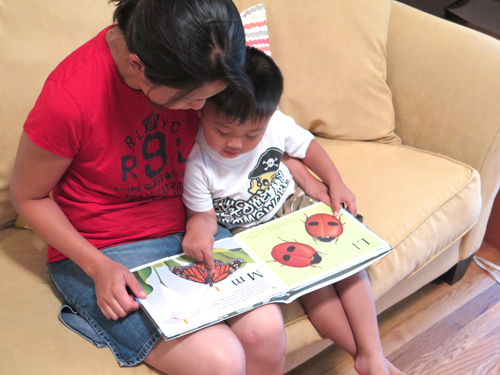 Our favorite of the three bug-themed books though was Bugs Galore. We loved the silly rhymes and fun illustrations of every bug imaginable. Reading that together as a family was an absolute treat. 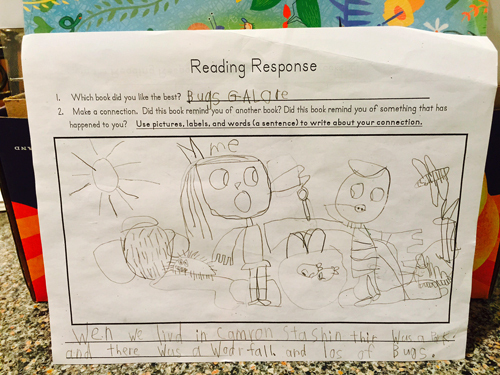 Addie enjoyed Bugs Galore so much that for her weekly reading homework assignment, she picked it as her favorite book and drew the illustration below. One of the items on my "to do" list has been to research fun and educational apps to put on our iPads. 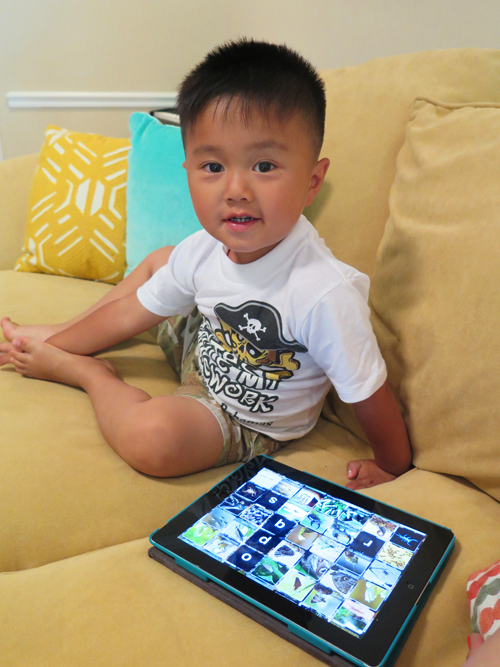 I’d much rather have my kids play with a well-vetted, kid-friendly app that they can learn from instead of watching TV. So I looked under the Mobile Apps section under Bugs, Birds and Animals, and spotted ABC Wildlife. When I clicked on it, the link took me to a review of the app on Common Sense Media, and I saw that the app was recommended for 3-6 year olds, the perfect age range for my kids. I’m so glad I had a pre-vetted list on Start with a Book to look through, as the world of children’s apps can be overwhelming, and I loved the simplicity of picking from a list organized by subject matter. It was organic. I didn’t need to plan much, and Taylor and I had a great summer exploration right outside our front steps. I learned how easy it is to use the on-line public library “hold" service. Check your local library for that service, and give it a try. It allowed me to find specific books I was looking for, and saved me a lot of time. We now have an app, thanks to Start with a Book, that gives my kids and I the chance to continue our summer exploration of bugs and animals. I’ll end this posting with a fitting photo of Taylor, tired from his bug hunting adventures. Grandma had perfect timing with sending along bug-themed pajamas for Taylor to wear. * A reference to the classic children’s book We’re Going on a Bear Hunt, one of Taylor’s favorite books.